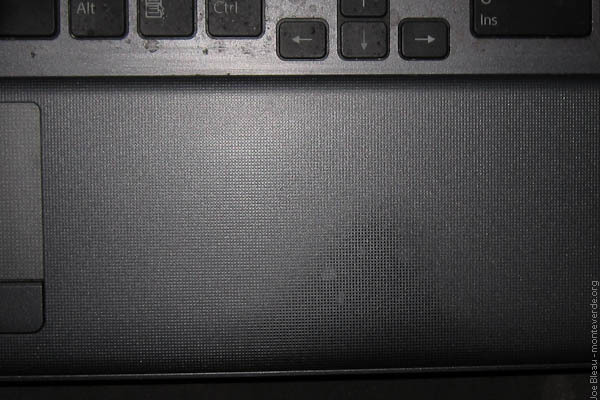 The palmrest discoloration is a problem with the paint sony_used on the 'black' F and Z series machines (if you check the Z series thread you'll see the same exact complaint). Apparently the silver/grey ones do NOT have that problem. Guys, please call sony_and complain about the black spots - those aren't normal (I don't care what Joe says). OoTLink is right, we are ENTITLED to perfect machines immune to wear & tear! He is right about the metallic gun metal paint that is applied on the keyboard side & the display's bezel for the North American black version. I dunno about the silver model or the Premium model with the rubbery palm rest found in EU, Asia & elsewhere. While I maintain my OS & system to tip-top optimized performance, I totally neglect the exterior except for cleaning the display's surface often with a damped microfiber cloth & occasionally deep clean using Nikon's lens cleaning fluid sprayed on the microfiber & not directly on the screen as I do to clean my expensive lenses. It's rainy season up here & I use often my F in the field and it is quite dirty after 5 months as I don't remember the last time I cleaned it. Sorry for the quality of the photos below, it's night time & I used a point & shoot camera. 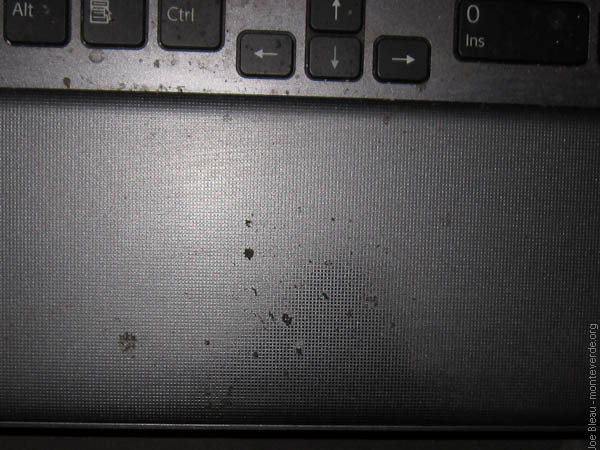 First image shows how dirty it is & the discoloration where my right wrist rest most often. You can see some really grimy spots. Second image is after cleaning lightly with a damp sponge. One can see that there is no discoloration where the spots were. They protected the paint. If you don't remove the advertising stickers, you will have some bright spots of new paint like when you remove stickers on a car after a year or so. Third image is after cleaning again with the damps sponge + a little bit of rubbing alcohol. 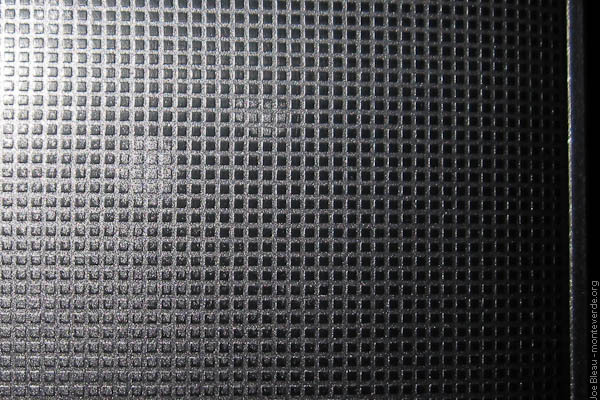 Forth is a macro photo showing the metallic paint wearing off on top of the texture. Note the spots where the grime was. 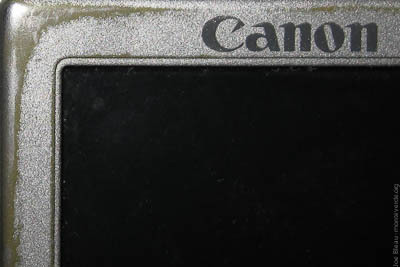 Lastly, I noticed that the paint is also wearing off on my Canon p&s as well as on several of my Nikon's DSLR's. OoTLink, do you think that I should also send them to the manufacturers & claim body parts replacements? Nikon & other major lens makers say that fingerprints contain human acid oil that eats the multi-coated lens finish & should be cleaned promptly. So if you want to limit the paint wear, I suggest you clean your palm rest once a week with a damp cloth with a little bit of alcohol or mild dish-washing liquid. Just be extremely careful that no drops of excess water fall in the keyboard or cracks of the touchpad unless you want to kill your F.
Thanks for the tip OoTLink but I don't think that I will spend $120 to ship back & forth my F to USA and be 6 to 8 weeks w/o it because of a patina that gives character to my machine, just like my scars & wrinkles. Women who prefer kids with baby faces are not my niche. I agree with Willscary's post including that my palm rest is cool & prefer paint wearing off than uncomfortably hot aluminum palm rest like for the Envy_and other brands. OTOH Sony_could have used colored plastic w/o paint like in my old_Acer so paint wearing off would not be a problem. I would guess that you are correct and that it the spots are from your hands. First, your hands contain dirt and oils that can discolor the plastic and secondly, if you use it enough, it could rub the plastic and take some of the texture and finish off. These marks are right where my hands are, so your thought is a good one. Can you feel the heat in these locations? Mine is cool as a cucumber unless I just plain hold my hands stationary on those spots for a long period of time, in which case the plastic seems to heat up to my body temperature. @ dappolo: cool image, I like the angle & lens choice! Hi all, been reading these forums for ages, ordered a custom Vaio F through Sony Style (eu) last month with the same spec as the VPCF12Z1E/BI (i7 740QM, 8GB RAM etc) but with a smaller drive with the intention of upgrading to an SSD - also got the free bluray burner offer so saved quite a bit of money than buying the VPCF12Z1E/BI package. The laptop arrived on Monday (Sony failed to send me any tracking information or my PDF invoice which annoyed me a bit, lucky someone was in to get it when it arrived ) I also bought my SSD (Intel Gen2 160GB) from ebay (£295 new with warranty! ). I read a lot on here about doing clean installs with recovery discs and decided that was the route for me, so went for it using Joes guide and kcirtaP's additional details about doing it on an F12. I didnt have to change any bios settings, the Optical Drive was already set to #1 boot priority. The one thing that surprised me the most, after restarting towards the end of the installer and hitting ctrl+alt+del to be ready to kill the vaio care rescue task after "installing restart driver" appeared to get a fully clean install, my machine automatically shut itself down and restarted before I could kill the task. Windows then booted and finished setup - with no additional bloatware or any Sony software installed (other than the drivers). So the recovery (for me anyway) gave me a clean install of Windows 7 without my intervention. I couldn&#8217;t install Vaio Care from my recovery disc 1 - it simply said vaio care failed to load when I tried to install additional programs from it. I solved this by just downloading vaio care from the sony support site. Always remember to reboot every time you are asked and not superimpose installations. I only seemed to have 2 of the above 4 as install options using my vaio care/recovery dvds, so I downloaded them all from the Sony support site. After that everything worked perfectly, and all that remained was to do windows updates etc. Sorry for the long post, hope this helps some F12 owners that want to do the same thing! Thanks to everyone on here for the knowledge they've shared, particularly Joe Bleau, kcirtaP and ilfuca, my laptop is running sweet as a nut now, and the SSD performance is amazing! i dont have NOD32 av. Thank you ajsuk for your feedback & very interesting observations! +1 to your reputation power. BTW one can do the same by clicking on this that you can see in the left column of a post you appreciate. You don't have any F12_screen captures (or photos) by chance that you could share & that I could add to the Vaio_F Series Clean install w/ OEM Discs article? I will add your comments & link to your post. "1 - I didn't have to change any bios settings, the Optical Drive was already set to #1 boot priority." - It's the same default on the_F11, I just added the detail so to give info about the BIOS options or to remind people who would have changed that option. Once your custom clean install is done, if you go back to the BIOS and change the boot priority to the main drive, your F will boot a tad faster because it will not have to check if there is a disc in the ODD. "2 - The boot option was not listed as "Restore Complete System", but rather "Vaio Care Rescue" (or similar, cant remember exactly)" - Could you do it again but w/o actually say the final yes to the restore process so you could take a photo of the screen? "3 - The dialogue boxes/install status windows while installing Windows were much simpler than the restore complete system photos shown in Joes guide, it was simply a single progress bar which asked for discs to be changed at given times. (I had 3 recovery disks as opposed to Joes 2 as well)" - Please guys, could the next person doing the custom clean install please take some photos of the different screens as I did? "4 - The one thing that surprised me the most, after restarting towards the end of the installer and hitting ctrl+alt+del to be ready to kill the vaio care rescue task after "installing restart driver" appeared to get a fully clean install, my machine automatically shut itself down and restarted before I could kill the task. Windows then booted and finished setup - with no additional bloatware or any Sony software installed (other than the drivers). So the recovery (for me anyway) gave me a clean install of Windows 7 without my intervention." - Wow, that's really cool! Did you press the combination keys ctrl+alt+del several times? As in the normal OS state, doing this forces a soft reboot which maybe you did w/o knowing it? That would be a cool tip, making the kill process easier. "5 - I couldn&#8217;t install Vaio Care from my recovery disc 1 - it simply said vaio care failed to load when I tried to install additional programs from it. I solved this by just downloading vaio care from the sony support site." - Good tip. It worked from disc #1 for my_F11 but then it's easy to download the OEM Vaio_Care from one's model specific esupport page before starting the clean install. And then I presume that you inserted your recovery disc #1 & Vaio_Care automatically gave you the option of installing the extra programs of your choice? "After that the only thing not working was the Vaio buttons (assist etc), so I red through kcirtaP's post which took me to ilfuca's guide, which has a step for fixing this:"
"I only seemed to have 2 of the above 4 as install options using my vaio_care/recovery dvds, so I downloaded them all from the Sony support site." I will also add this to the guide. I read a lot on here about doing clean installs with recovery discs and decided that was the route for me so went for it using Joes guide and kcirtaP's additional details about doing it on an F12. Thank you ajsuk for your feedback & very interesting observations! +1 for your rep power . Afraid not, I didnt have my camera handy at the time and was concentrating on making sure it all went smoothly as I was short on time - if for any reason I need to do it again, I will take photos. Sure, I will try and get one tonight! I dont believe so - I had hit ctrl+alt+del quite some time before it shut down, I had task manager ready as your guide says so was sitting with my cursor over the end process button, but just when I was about to click it it shut down for me. What is battery life for sony vaio F12 with standard capacity and large capacity battery ?? Also, please mention battery life for standard usage, movie playing, heavy application use etc. Ive discharged my full charged battery from 100% to 1% (auto sys shutdown) and charged it full 2 times but it still reports 84-87 % battery on launch in next morning. Hibernation is turned off, also I dont have Sleep enabled. battery Care is Off also. Any other hints how to achieve almost 95-100% battery when I launch my lap next day ? 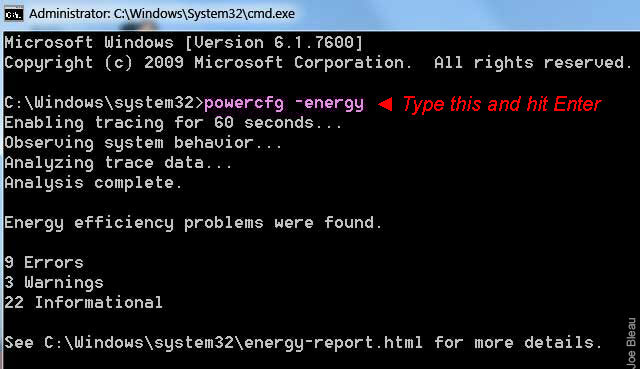 Run powercfg -energy. 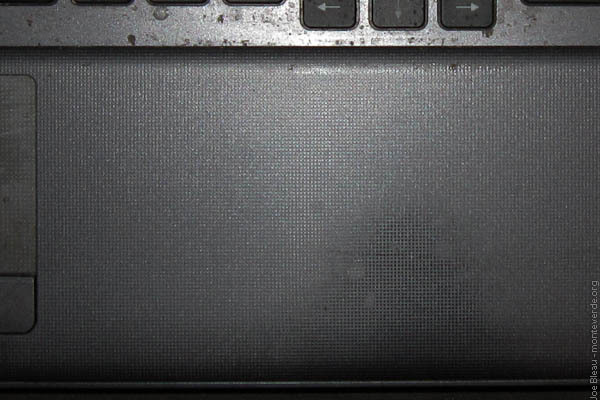 See: VAIO_F Series & Battery Discharging Overnight? Average (ie non CPU/GPU intensive) use on a large capacity battery tends to be around 3 hours for the large capacity and 2 hours for the standard. As an owner of the "black" F, I am a tad worried about the discoloration. If it appears, I may have Sony fix it. Otherwise I think that a little bit of metallic spray paint might do the trick. For those looking to get a backpack for their laptop, Costco currently has an incredible deal on one (see here). The pockets designed for the AC adapter are a little tight for Sony's behemoths, but there are plenty of pockets and it fits 17" laptops. The bag is very well made and feels very sturdy. Only $50 (USD) right now!